Even if baking cookies isn't a big part of your holiday tradition, you'll love this recipe. 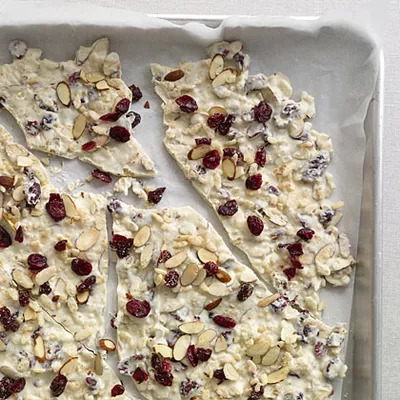 After just 15 minutes of prep and 30 minutes in the fridge, you'll be enjoying a sweet and crunchy treat that's loaded with heart-healthy dried cranberries and almonds. And if dried cranberries aren't your fave, they're easy to swap out for dried cherries, blueberries, or other dried fruit. Just spread sliced almonds and unsweetened coconut on a baking sheet and toast for 5–8 minutes at 325 degrees. Combine almonds, coconut, rice cereal, and dried cranberries in a bowl, and set aside about 1/4 cup of the mixture. Melt the white chocolate with 2 teaspoons of vegetable oil in a large heatproof bowl, set in a medium saucepan of simmering water. Fold the almond mixture into the chocolate and spread it on a parchment-lined baking sheet. Sprinkle on the reserved mixture. Refrigerate for about 30 minutes and--voila!--a delicious holiday bark that serves 30.